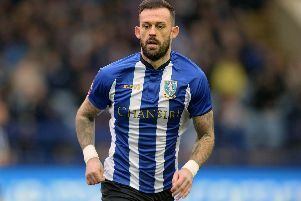 While this season will not go down as memorable one, for positive reasons at least, Sheffield Wednesday's players are aiming to ensure it ends on a high. With seven games remaining and victory over Preston on Friday - bar a catastrophic series of events - all but ensuring that they'll be in the Championship next season, having flirted with relegation, there doesn't appear to be much to play for, between now and May. That, however, is not an opinion held by Barry Bannan and his team mates. With many of the squad having missed large chunks of this campaign through injury, Bannan says there remains a hunger in the Owls dressing room to finish the season as high up the table as possible, before taking a break and getting ready to set about a renewed challenge. Bannan was one of those struck down by a lengthy spell out of the team and he says morale in the squad is rising, helped by two wins on the spin and the return to action of some very important players. "It would be easy to let the season fizzle out as if there was nothing to play for but the players we have in there, there's a lot of hunger in that changing room," he said. "Players who are coming back, who have missed a lot of the season, they don't want the season to end, I don't want the season to end. "So we will keep going out there playing games and our aim is to win every game to the end of the season. Since I have been back we have won two games, confidence is building and you can see players getting a lift from others coming back. "It's a good time at the minute. Forestieri coming back, Hutchinson, Tom Lees, big Atdhe is on fire, Lucas ... everybody's confident and it will make for a good end of the season. "We are focusing on finishing the season strong, coming back next season and having a real good go again." Bannan made his first start since early December in Friday's 4-1 win against play-off chasing Preston. "I enjoyed it," he said. "Its been a hard few months personally but I enjoyed that, the main thing was about winning but for me personally I was happy to be out playing. "I thought we did well second half. First half we were a bit off it, we didn't get to grips with how they were playing. We had a talk at half time and came out stronger and pressed higher up the pitch. The extra striker (Lucas Joao came on at half time) may have helped to unsettle them and we were delighted to get the points."